As a parent, you want to teach your child the basic skills they need to survive in this world. Morals, values and manners are a parent’s responsibility – not a school teacher’s. You also want your child to be ready for formal schooling so that when they enter the school system for the first time they are not intimidated, afraid or embarrassed. There are many opportunities, found in everyday activities that can be used to teach your child some basic skills. For school, your child needs to know the basic shapes – circle, square, triangle, rectangle, oval and diamond. Find them at home, on the way to the store, in the park, and keep pointing them out until your child starts doing the same. 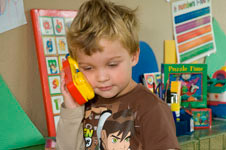 Children often use colors to help them associate objects with their names. Help them by describing everyday items by their color – the red apple, the gray building, the blue sky etc then let them point out the colors of different things they encounter. Count everything and anything with your child. Buttons on a jacket, stones in the pot plant, birds on the telephone wire, windows in the house, apples in the basket – wherever you are, whatever you are doing, there is something that you and your child can count. There are so many labels, advertisements, billboards and signs to read that your child has millions of opportunities to see and recognize letters every day. Point the letters out, let your child sound them out, and encourage them to find letters wherever they can. When your child says ‘There’s a bird in the tree’, explain what it may be doing in the tree – looking after its nest, looking for food, or just resting after flying for a long time. Try to identify the bird and whether it has any distinguishing marks. Do the same with plants, other animals, places and activities. Every explanation you give will be soaked up by your child, and may give rise to more questions. If you can’t answer a question, be honest about it, but find the answer – either in a book at the library, or on the internet. Adults may have become accustomed to their environment, even bored with it. Children still find the wonder in a bird flying, a flower opening and closing or a butterfly landing on a flower. Feed their curiosity, encourage them to ask questions, and to practice what they have already learnt. Preschoolers absorb information at an incredible rate, and the more you give them, the more they will seek. That insatiable seeking should be encouraged, as it is what equips them to continue learning and developing once they are at school.